The LG K8 (2018) is clearly meant to be a budget phone, despite the fact we don't know the price of this thing, nor when it will actually be released - but if it is cheap enough, then this could be a little budget winner. 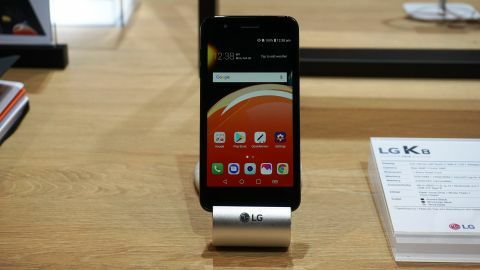 LG is clearly positioning this phone to be something that's for those that want a little bit of technology in their lives, or just want a phone that's not terrible, but for a decent price, and if the cost is low enough then this could well be a success. Unlike the metal-clad LG K10, the K8 has a grippy outer plastic shell, with a grid-like design that's pleasant to hold. The camera has been moved centrally, sitting just above the fingerprint scanner (another nice feature to see). However, it doesn't feel too light or cheap when you pick it up, nor with a lot of flex when put under a bit of stress, which is often a sign of good quality build. The screen, a 5-inch affair, uses LG's In-Cell technology, which helps improve the quality of a basic LCD display. In use, it does offer a great contrast ratio with good-looking blacks and nice color reproduction - we'd have expected a lot worse for a phone of this quality. The resolution isn't the best around, with it only being 1280x720, but at the screen size it's not too bad with 279 pixels per inch. The overall use is a touch laggy, and that makes sense when you consider that it's got a quad-core CPU inside with 2GB of RAM. Not a terrible spec, and with 16GB of storage inside you'll probably get away with using this over a couple of years without having to worry too much about deleting a load of photos. We found that some things, like Google Chrome, were a touch slow to load but this is a prototype at MWC 2018, so there's every chance the final version will be a bit slicker. The camera on the LG K8 (2018) isn't world-beating at 8MP (are you sensing the theme here yet?) but not too bad for a cheaper phone. The front-facing camera is a 5MP sensor, and supposedly packs a front-facing flash by flaring the screen when taking the pic, but it seemed a bit dark to us. The rear camera supposedly helps improve low-light noise, presumably through software processing, and the darker pictures we took seemed just fine - not mind-blowing, but OK. There's also a feature called Flash Jump shot, where you can take a series of pics together and turn them into a GIF to share, hinting that this phone is aimed at the younger (or young at heart) generation. There's a 2500mAh battery pack on the LG K8 (2018), which probably will last pretty well given the minimal spec on offer here. If you compare that to the Sony Xperia XZ2 Compact, for instance, that has a 2780mAh power unit and that has far more work to do. There's nothing like wireless charging on offer here, but then again we wouldn't have expected it given the possible price point. There's very little to laud on the LG K8 (2018) without a price around, but if our suspicions are correct, this could be a decent phone at the low-end as the big brands start sticking their high-end tech in more budget models. The key question will be: can the LG K8 stay running well after a few months when it's filled with apps and photos, or will the little judders we're seeing now turn into bigger slow-downs? You'll have to wait for our final review to find out, so stay tuned for that to turn up.